Congratulations to Christian Yelich on winning the 2018 National League MVP award! Yelich had an All-Star worthy 1st half of the year and a historic 2nd half of the year where he led the Brewers to the NL Central Title. He showed an incredible ability to both hit for average and power as he took home the NL batting title and also led the league in slugging percentage. 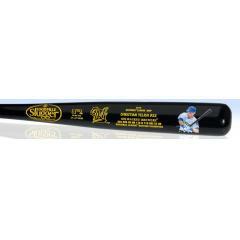 This gorgeous Christian Yelich official National League MVP Louisville Slugger bat is the perfect commemorative for his spectacular season. This bat features a reproduction of exclusive original artwork by famed sports artist, Jolene Jessie, displayed prominently on the barrel. The bat also includes the Brewers’ logo, and Yelich’s incredible stats and accomplishments from the 2018 season. The bat measures 34 inches and weighs approximately 33 ounces. The bat is limited to only 5,000 pieces so order yours before they are gone!